Extract of fruits from eight cultivars (Kwaasi et al. 1999). After washing the fruits, the seeds were aseptically removed and then extracted in phosphate-buffered saline (PBS, 1:5 w/v). Afterward, 2% polyvinylpolypyrrolidone (PPVP), 2 mM ethylene-diaminetetraacetic acid (EDTA), and 10 mM diethyldithiocarbamate (DIECA) were added to prevent proteolysis, and thiomersal (0.02%) was added as preservative. The slurry was centrifuged (20 000 g for 30 min at 10°C), and the supernatant was extensively dialyzed (4°C, 72 h) and freeze-dried. Some lyophilized samples were reconstituted in distilled water (1/10, w/v) and glycerinated (1:20 w/v) for skin testing. Fresh date and extracts (Gonzalo et al. 1997). Crushes dates without seeds were extracted at 20% (w/v) by shaking for 1h at room temperature in ammonium bicarbonate 50 mM, pH 8, followed by 30 min, 10°C, centrifugation at 20 000 g. The supernatant was filtered, delaysed against water, lyophilised and stored at 4 until use. Protocol: (controls, definition of positive etc)Prick-prick technique. Saline solution was used as a negative control and 10 mg/ml phosphate histamine as a positive control. Reactions were positive if the largest wheal diameter was > 3 mm (Gonzalo et al. 1997). 19 patients (Kwaasi et al. 1999). All the 19 patients were SPT positive to at least two fruit extracts (Kwaasi et al. 1999). Extract fruits from eight cultivars (Kwaasi et al. 1999). After washing the fruits, the seeds were aseptically removed and then extracted in phosphate-buffered saline (PBS, 1:5 w/v). Afterward, 2% polyvinylpolypyrrolidone (PPVP), 2 mM ethylene-diaminetetraacetic acid (EDTA), and 10 mM diethyldithiocarbamate (DIECA) were added to prevent proteolysis, and thiomersal (0.02%) was added as preservative. The slurry was centrifuged (20 000 g for 30 min at 10°C), and the supernatant was extensively dialyzed (4°C, 72 h) and freeze-dried. 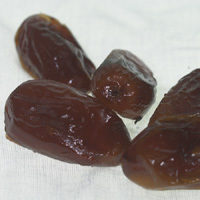 Date extracts (Gonzalo et al. 1997). Crushes dates without seeds were extracted at 20% (w/v) by shaking for 1h at room temperature in ammonium bicarbonate 50 mM, pH 8, followed by 30 min, 10°C, centrifugation at 20 000 g. The supernatant was filtered, delaysed against water, lyophilised and stored at 4 until use. RAST, ELISA and Immunoblotting (Kwaasi et al. 1999 and 2002). 19 patients (Kwaasi et al. 1999 and 2002). RAST was 1+ in 3 patients, 2++ in 3 patients, 3+++ in three patients and 4++++ in other 4 patients. IgE ELISA results revealed that sera from seven of the patients in whom positive SPT responses were elicited to the different extracts gave relatively low ELISA scores (Kwaasi et al 1999). Patients reacted to two main bands of 14 and 30 kDa (Kwaasi et al. 2002).